The adoption of 4K & Ultra HD has A/V enthusiasts scrambling to ensure they have the right cables to support this new wave. Fret no more, Velox cables are the accessory you need to ensure your UHD 4K setup will be ready to go. 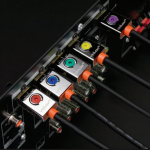 SSAVI is excited to announce that we currently carry the whole Velox family of cables for all your home theater installation needs. One of the great things about Velox cables is that they are assembled right here in the U.S.A. You can be sure you are getting high quality craftsmanship and quality control, as well as supporting businesses that make their living providing our country with high-quality products. This new patent pending module developed by in-visions technology allows the Velox UHD cables to deliver a verified 18 Gbps HD signal for higher resolution, frame rate and better color over HD digital interconnects. The cable operates with the entire 18 Gbps envelope allowing for crystal clear, reliable picture in your 4k set all the time. Also including an innovative new version of a symmetric HDCP and EDID rise time accelerators on the display data channel, the Velox UHD cable eliminates EDID errors and HDCP handshaking issues. All of this combined ensures signal integrity and synchronization and a reliable stream of the newest format, day in and day out. What does this mean? DPL laboratories provides third party technical testing of HD products to ensure they meet performance standards. Companies submit their products for testing and if they pass the testing protocols receive the DPL certified seal of approval. Only the best products on the market will pass the test to support 4K and the Velox cable line passed with flying colors. Other cool features include color coded nubs that can be attached to individual cables to keep everything organized, and lengths up to 15 meters enhancing their value to the home theater enthusiast. As new Ultra High Definition formats become more common it is important to make sure your home theater is equipped to handle anything you throw at it. If you have any questions about any products that South Shore Audio Video Installation carries or would like to kick-off your next home theater project, give Kirk a call at (617) 283-9932 or fill out the form on this page today!